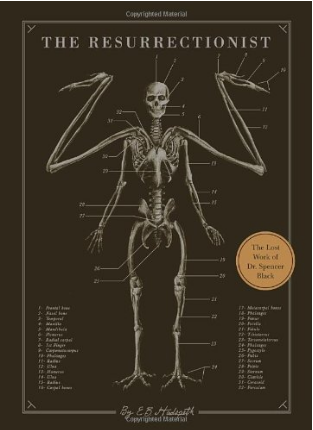 The Resurrectionist is about the works of Dr. Spencer Black. The book is broken into two parts. One is a short biography of Spencer Black starting with his youth helping his father rob graves and growing into his medical schooling up into himself basically becoming a Darwinist. It’s an interesting little biography that takes up about the first 65 ish pages of the book. The rest of the book is the codex created by Dr. Black. This is one of the cooler parts of this book as the artwork and the theories here are very interesting and draw you in. This book is like a mix of reading a biography about Darwin and the Island of Doctor Moreau. At times the book goes into weird creepy areas and at the end, it feels short because of all the pictures. The pictures really bring the book to life. One of the main thoughts behind the book is that the physical deformities of humanity are just evolution adapting to our reality. The way this is written, almost like a real history, really helps to give that feeling that maybe Dr. Black is right when everyone says he’s wrong. I would call this book a fun look at “Dark Evolution Theory”. 61 out of 86 stars. Stars are silly. Hopefully, the information above helped you figure out if this was a good book for you! All stars really do is obfuscate the darkness that slinks behind.